hackwriters.com - Why Go To India? Indians are overwhelmingly untroubled, healthy, joyous, life-affirming people, a fact that anyone who has spent time in traditional villages and among local people can affirm. India is sometimes mentioned in the news because it is “the world’s largest democracy.” Recently it has been making news because of its relatively new Prime Minister, Narendra Modi, and his opening up of the country to international investment, business and consumerism, which has led to an enthusiastic embrace of globalized consumerist culture, at least on the part of the country’s vast middle class.Also, unlike other internationalizing developing economies from China’s to Brazil’s to South Africa’s, India’s has remained largely unscathed by the 2008 financial crisis, its growth much less retarded than that of those other countries. India also makes news because of civil conflicts, usually resulting from an incompatibility between ancient traditions and the imperatives of modernity: women’s rights, caste and religious issues, affirmative action programs, etc. But India has another distinction, one not very well publicized, that sets it apart. It is a distinction that makes it unique and vital for us, for our understanding of ourselves and our society. India is the world’s last living ancient civilization, and that civilization is thriving, even alongside the wholesale transformations that modernization is bringing to the country. Unlike the other great ancient civilizations, all of which have become Christian, Islamic, secular or communist, India’s culture still remains archaic: its ancient Hindu religion comprises sophisticated varieties of animistic and pantheistic world views. This means that the ancient gods and goddesses remain alive and present and relevant—people walk by day and sleep by night in the company of their divinities. 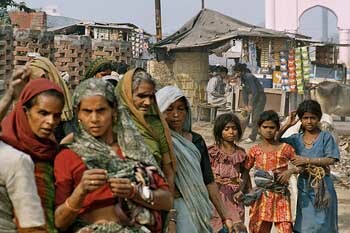 India is a huge country, but although it has what is probably the world’s largest middle class (300 million or so people), that remains a minority, comprising less than 25% of the population. This means that three-quarters of Indians (more than a billion souls) still live lives rooted in ancient traditions, religions, sciences, rituals, skills, and ways of living and working. These are often dismissed as unscientific, based as they are on myth, superstition and ignorance. But, and it’s a big but, Indians are overwhelmingly untroubled, healthy, joyous, life-affirming people, a fact that anyone who has spent time in traditional villages and among local people can affirm. Indians live in a divine, marvelous, magical universe, alive with beings and consciousnesses we moderns have dismissed as phantasms—gods, goddesses, semi-divine beings, ghosts, spirits and demons. For Indians these are living presences, having incalculably vital effects on people’s lives and environments, on how they think, on what they do, and on how they do it. The ways in which people interact with this very present and palpable divine world in which they are immersed is through ritual. Performing rituals, say the ancient Indian texts, is humans’ most important work, more important even than seeing to their own physical, material or economic well being. For Indians do not see themselves as individuals, essentially separate from their world: they are seamless parts of it, as limbs are of an organism; and so what people do affects the whole of which they are parts. Rituals are actions essential to the proper functioning of the cosmos, the rising and setting of the sun, the ongoing of the seasons, the sowing and ripening of crops, the harmonious functioning of the communities in which they live, right down to the smallest details of life. People are not mere adjuncts of nature and the world, but essential, interdependent parts of it. This way of understanding and being in the world is radically different from that of us moderns; so seeing and being in this ancient reality in which everything is alive, in which divinity is right here on earth, is not only refreshing, embracing and eye-opening, the stark contrast it presents with our understanding of reality provides us with insight both into our world and ourselves. The French writer Marcel Proust said that the purpose of travel is “to have new eyes,” and no place so generously bestows new eyes upon us as does India. Martin Noval was a professor of philosophy at universities in the US and Canada. He’s lived in India for more than thirty years and along with his wife Carol organizes and conducts tours in India and the Himalayas. Their website is www.tripsintoindia.com. We wanted a break desperately from the pollution and the stress of living in the heart of Bangalore.